In the realm of menswear, pants – perhaps more than any other category – often end up being an afterthought, despite the range of materials that exist. After all, it’s generally much more exciting to pick from hundreds of styles of dress shirts or to shop for those personalized touches like cufflinks or shoes. But we urge you not to make the mistake of forgetting about pants, or you might miss out on some super luxurious fabrics and the best colors and patterns of the season, not to mention the newest performance technology in the industry. Wool pants are generally considered the workhorse of trousers. Wool is a naturally durable and wrinkle-resistant fabric, drapes well, and is offered in a variety of weights to suit any climate. For example, lighter tropical-weight wool is best for Spring and Summer, and heavier, year-round weights are perfect for cooler weather. 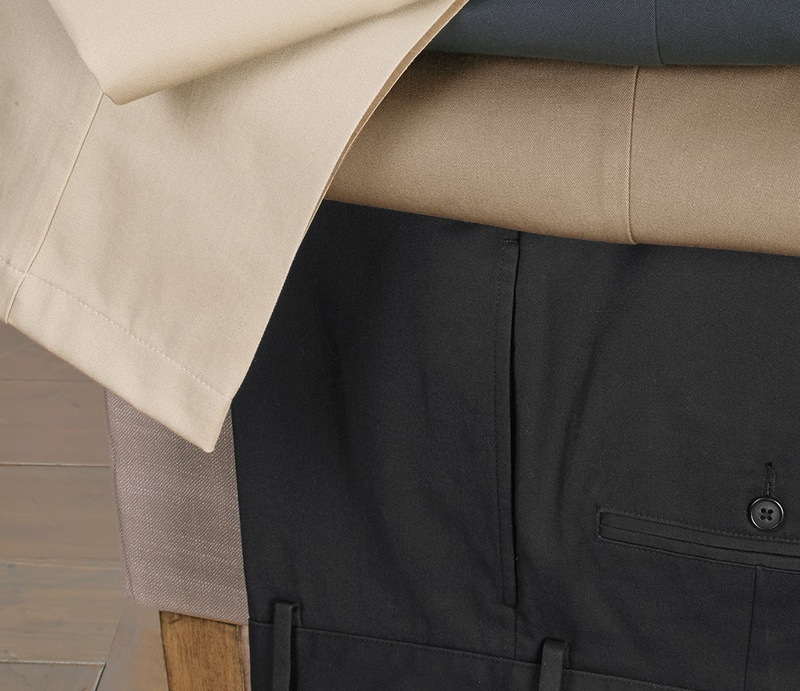 All of these considerations make men’s wool dress pants an excellent choice for everyday wear. Despite these styles all falling under the descriptor of “wool,” the specific construction of wool pants can make a big difference in their wear and appearance. In addition to what one might think of as the stereotypical wool look, it is possible to add texturing like twill, a diagonal slant created by interlacing the warp and weft, or featherbone, essentially a miniature herringbone. Also offered are wool gabardine, a tightly-woven twill that is smoother and less “fuzzy” than traditional wool fabrics, and wool sharkskin, a very soft, very smooth fabric with a slight texture and sheen. You might notice the designation of “Super 120’s” applied to several of our wool styles. It denotes the greater fineness of the fibers spun into the yarn of the wool, which thus corresponds to an increase in smoothness and softness of the fabric. If you’re not particularly keen on any of the 100% wool options we offer, you may perhaps prefer a wool blend, which takes all the easy wear advantages of wool and combines them with the look and feel of luxury fabrics like silk or cashmere. Cotton is another big contender in pant fabrications. 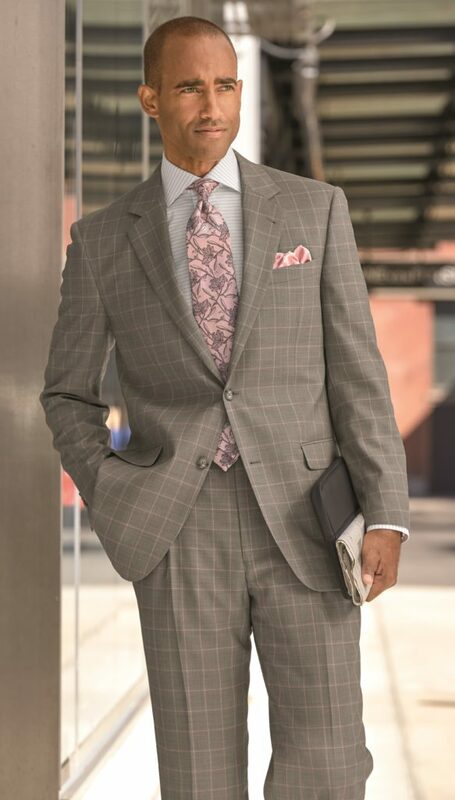 Indeed, some of our most popular pant styles are made from pure cotton, like our denim pants and our seersucker suit separates, which are woven in a precise way to create a puckered effect that greatly increases airflow against the body. 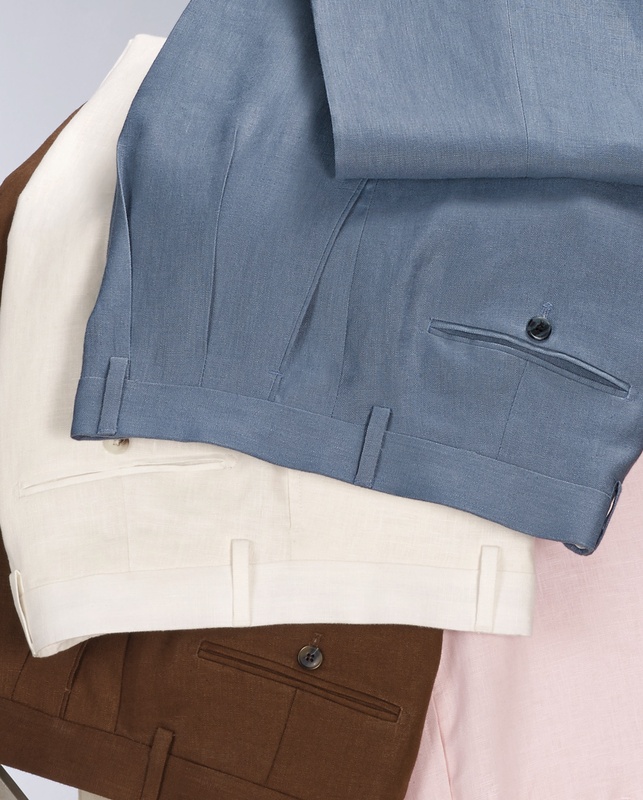 Casual 100% non-iron cotton chinos are made from a smooth cotton twill fabric and are known for being extremely durable and super easy care, just like our famous non-iron dress shirts. In addition to these wonderful natural fabrics, we’ve developed a line of performance pants made from microfiber. Simply put, the use of synthetic fibers makes it possible to develop for and combine very specific aesthetic and functional qualities. Microfiber is a performance fabric because it has been created to be soft, durable, wrinkle-resistant, and stain repelling. 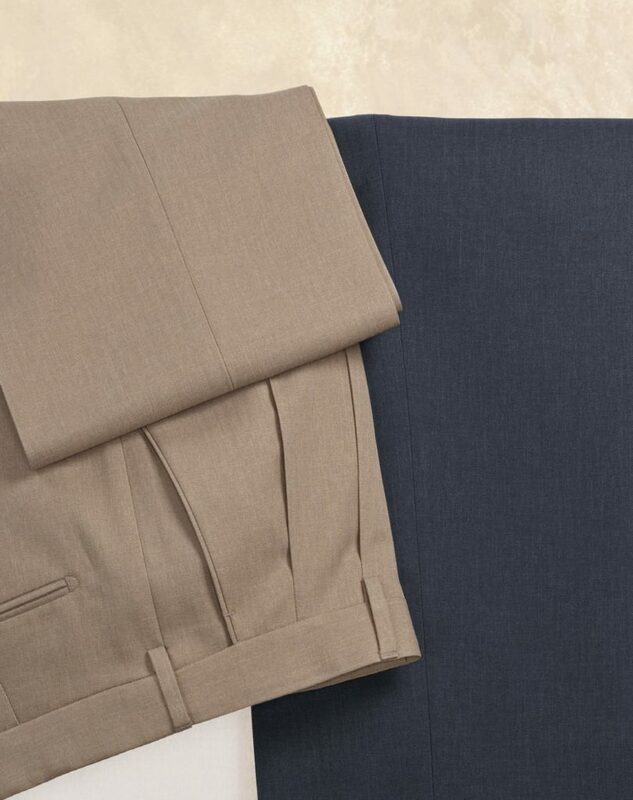 Within this collection we have a solid microfiber pant that comes in both pleated and flat front style. A relatively recent addition to the performance category is our Comfort-Waist Microfiber Herringbone Pant, which boasts a waistline with a slight stretch for increased comfort, and is also offered in both flat front and pleated. Microfiber is incredibly easy-care and can simply be machine washed and tumble-dried. All in all, there are so many options to choose from when shopping for pants. You’re bound to find a style you love!